Since the return of grey there has been an increase in demand for sultry shades with blackout bathrooms becoming the must-have style. Bold shapes and deep tones make a strong statement for a maximalist aesthetic. It’s also far more forgiving than the minimalist approach. For one, you can decorate without the constraint of clean lines and minimalism. And two, there’s the practical aspect of not worrying about spills and scuff marks on the furniture. The key to a dark interior style is to go for luxe textures and statement features. Proving dark coloured rooms need not be dull, there’s the option of installing polished copper door handles onto painted timber doors. Often described as rose gold, this style of handle adds warmth and glow to all rooms in the property. 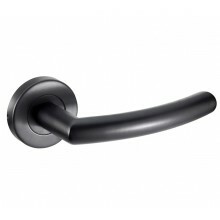 For a striking and textured effect, the matte black industrial inspired door handles with knurled detailing is the style to adopt. 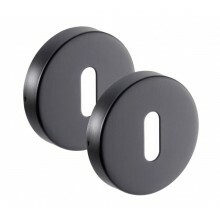 Black hardware, such as hinges, key covers and bathroom locks, on dark grey or black timber doors offers a cohesive aesthetic. By distracting attention away from the architectural structure, it enables focus on dramatic statement pieces. Perhaps an elaborate form of colourful art on the wall or a Greek key coffee table crafted from glass with gold finishes. It’s normal to experience hesitation towards using a dark paint on the walls. 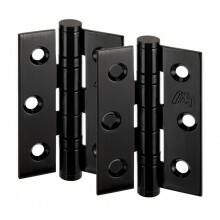 But it isn’t only varied shades of black and grey that apply to the dark trend. Aubergine purple, midnight blue and emerald green interiors offer a stylish twist to the gothic aesthetic. It’s these shades that are quickly becoming the go-to for counters and cupboards in contemporary kitchens. Usually combined with light walls and varied tones of hardwood flooring, the style sings elegance. 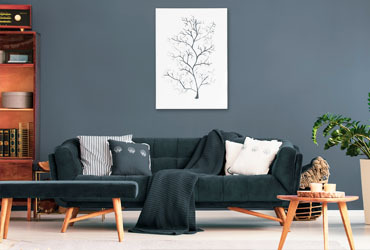 Many are opting to paint one dark wall within a room to capture the daring effect without committing to a complete refurbish. This approach can be seriously effective! And it gives you the option to blend light and dark elements with bold colours and pattern. Imagine one dark emerald green wall, surrounded by white walls, laced with quirky copper metal décor. Envision a round copper frame mirror placed above a striking white chaise lounge… effortless class. Plush velvets are a popular luxe piece in lounge interiors and bedrooms, embedded within cushions and opulent statement armchairs. Dulux has named 'Spiced Honey' as its Colour of the Year for 2019; it’s the perfect cappuccino shade for any home and a great option to complement darker shades. Whether you chose to go all out or to simply spice it up with dark shades, there’s an option for every interior. Create a mood board of inspiration and execute your refurb plans from there! We hope to inspire your home improvement projects and offer a variety of high-quality products that excel in both aesthetic and performance. For more interior inspiration, check out our previous blog Bold Moves Towards Self Care & Peace and find out how you can create your very own spa-inspired bathroom.